Welcome to the first "I Made it Monday" - this is a personal challenge to wear something I have made or refashioned every Monday. I hope you join in! 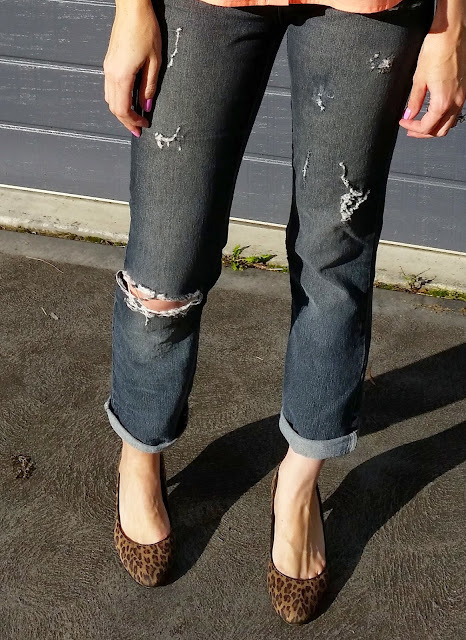 I thought I'd start off simply with a refashion that anyone with a pair of scissors or razor can do - distressed denim. The practical Mama part of me could not bring myself to buy (let alone pay extra for) jeans with holes in them when I have so many pairs of jeans and anyone can make holes! I love that distressed denim is back in vogue. I remember when it was in during the late 1980's and I wanted ripped jeans in the worst pre-teen angst kind of way. Everyone had them. It was SO unfair that I didn't have them. You get the idea! However I was not allowed to buy them or "destroy perfectly good jeans". Well now that I'm a grown up I can do as I please with my jeans! (The irony of that sentence sounding very immature is not lost on me.) When I saw distressed denim hit the market again I grabbed an old pair of jeans which had been given to me and were too short, which is why they are cuffed, (no money spent and no loss if they went horribly wrong!) and a pair of scissors and started to distress. To distress the denim I simply rubbed them with the blade of some sharp scissors until the desired level of distress was achieved. I ripped out the knee a little, which later became a lot when my 2 year got her little hand in there and ripped them some more! Here's a handy hint: don't distress whilst wearing them...I think I took off some skin. Do however, mark where you want the distressing to be whilst wearing them. Shirt: Mix Apparel.com not a Tall size, but a good length / Necklace: Made By Me! Ta da! A pair of distressed jeans of my very own and it only took me almost 30 years to get them! Have you tried to distress your own jeans? How did it go? Your so funny. I had the hardest time buying distressed denim at first too. My first pair the hole in the knee got so big, so fast, I ended up cutting them into shorts. Now I'm on my second pair, and I'm 'babying' them so the hole doesn't get too big again. I like distressed denim a lot, except for that issue. You did a great job distressing your jeans! I have not given it a try but have been tempted.